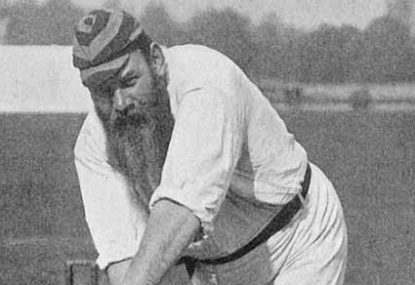 WG Grace would be a killer Twenty20 player. Image: Wikicommons. Fitness and a lean body are clearly grossly overrated, for there have been many cricketers through the ages who have believed in this adage and gone on to have careers, some long and some a trifle shorter, at the highest level. So why give up on good food when you are so good that fitness doesn’t matter? Sir WG Grace would never have passed muster as a sprinter. But mid-way through his career, the good Doctor could have faced up to a Sumo wrestler with some degree of confidence. And yet that didn’t seem to affect his cricket. 54,000 First Class runs and 2800 wickets at an average below 18, don’t suggest that his girth was ever a concern to him. Warwick “The Big Ship” Armstrong was estimated to weigh around 21 stone (133kg) when he captained Australia after the First World War – but it didn’t seem to affect him much, as he won his first eight Tests in charge, all against England, including the first Ashes whitewash, in 1920-21. He scored six Test hundreds, a triple-century in First Class Cricket, and for good measure took 87 wickets with his leg spin. He didn’t particularly like being heckled about his weight though. Arjuna Ranatunga, the former captain of Sri Lanka is an immediate recall when we speak of generously endowed cricketers. Ranatunga, remarkably, was also a part-time bowler, who occasionally unleashed his military medium-pace. In a One-Day International (ODI) against India at Kanpur in 1986, the hosts were chasing only 196 to win. Ranatunga produced astonishing figures of 6-1-14-4 and bundled India out for 78. But he couldn’t, or didn’t, run, between the wickets or on the field, even if his life depended on it. He would call for runners and substitutes pretty regularly and irk opposing captains. But all of that fades away when you remember the late cut he played off Glenn McGrath to hand Sri Lanka their only World Cup trophy to date. No account of cricket’s big men can ever exclude the outrageously talented Inzamam-ul-Haq. It seemed the link between the big man’s brain and his legs had major breakdowns when he batted. Surprisingly, the link worked fine when he was playing his delectable strokes. At the start of his career, his running between the wickets was a series of laughs. A big guy calling for a run, calling it off and then calling again and getting stranded midway with a totally bewildered look on his face. It could not possibly have got worse from there! And indeed it improved, because he got smarter. He hit more boundaries, ran ones when others would have run threes, and most times, he just turned his back on his partner! If he hadn’t been a brilliant batsman and a genuine gentle giant, he probably wouldn’t have lasted as long as he did. An average of 50 from 120 Test matches with 25 centuries, after all, has to be some recompense for a few missed runs.